If you are looking for a quiet grow room exhaust fan you will be very happy with the Soler & Palau TD-100X which is whisper quiet. These fans come with a 5 year warranty and have been specially designed to maximize airflow and minimize noise levels all within the smallest and most compact housing size possible. Why Buy A Quiet Grow Room Fan? 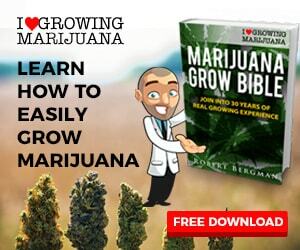 I grow medical marijuana legally but for security reasons I want a stealth grow, which means everything must be quiet. There are many grow room fans to choose from but I found most to be way to noisy and bulky for my grow tent. I really can not hear this fan run when my closet door is shut and the only real sound it makes is that of moving air. Maintaining adequate grow room ventilation is important for healthy plants and good harvests. I had been relying on passive exhaust but after adding a second HPS lamp to my tent temperatures and humidity levels demanded an active exhaust system. 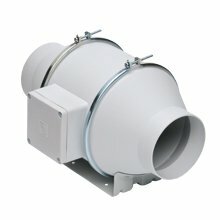 The Soler & Palau TD-100X is an inline exhaust fan that comes with high and low settings of135/100 cfm. It uses standard 4″ flex ducting. 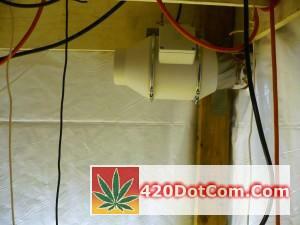 This unit provides almost 4 air exchanges a minute for my 2′ x 3′ grow tent. It is also available in a slightly smaller version the TD-100 rated at 101/97 cfm and other sizes for larger areas using up to 12″ ducting and rated at 1050/751. You can view all the Soler & Palau inline fans here. The fan itself is very well made and constructed of a very hard plastic composite material. It has a very sturdy mounting bracket that is riveted to the housing. The thing I really like about the TD 100x is its smooth streamlined shape. This fan weighs about 5 pounds and was designed for tight spaces and is moisture resistant making it an excellent choice for a bathroom exhaust fan or any ventilation project. The Soler & Palau TD-100X is not hard to install but there are some things to be aware of. In order to mount this fan you are supposed to remove the two retaining rings and slide out the fans core which exposes and gives access to the mounting holes and then replace it when you are done and tighten everything up. But I decided to hang my fan with copper wire I had on hand and was able to skip this step. You may want to do this too especially if you think the fan may need to be moved later. I personally prefer hanging because although this fan is very quiet I feel this method eliminates any possible vibrations. The td 100 x does not come with a power cord so either buy one or swipe one off an old appliance. Inside the junction box there are three terminals, a common, low and high. It is very important that one wire go to the common terminal and the other wire go to either the high or low terminal. Do not connect a wire to each! On my unit there was a plastic strip in front of the high terminal. You will need a small standard screwdriver to tighten down the terminal screws. I recommend connecting to the high terminal. If there is too much airflow you can use an external fan speed controller. I would highly recommend the TD 100X for a quiet grow fan. The Soler & Palau TD-100X Quiet Grow Room Exhaust Fan should be adequate for up to a 4 x4 grow tent. This inline exhaust fan is well made, sleek and quiet and will provide years of service. It is available from Amazon for $88.80 with free shipping. Click here to go to Amazon and order. You mention connecting one wire to either the high or low speed screw.. Does this adjust the speed accordingly? Also, which speed controller works with this fan? The brochure says it’s “suitable for voltage speed control” but I’m not sure exactly what that means. Yes it will adjust the speed but I would recommend using the high speed terminal. If you want to adjust the speed further you can use a fan speed controller. I have heard the cheaper ones can make fans hum but haven’t used them because they mess with the sine wave not the voltage itself and I dont think that is good for the motor. Instead I use a variac which changes the actual voltage to the fan. Here is a link to the one I use Variac Variable Transformer You can run the fan from a whisper to full throttle with no humming and infinite control of the speed.